Engagement, empowerment, access, collaboration, and feedback. Those are just a few ways HSU Provost Alex Enyedi describes the benefits of the campus’s move to new classroom software. The HSU Canvas Team is providing numerous Canvas Support Drop-In Sessions and Teaching and Learning Luncheons. This October, Enyedi presided over the official launch of HSU’s conversion from the Moodle learning management software (LMS) to Canvas, an open-source education system that aids in the administration, documentation, tracking, reporting and delivery of university courses. The Canvas LMS has been in testing since spring with 98 faculty members teaching more than 3,500 students in 100 courses in the Canvas Pilot Production environment. “The move to Canvas is truly a faculty-driven, shared governance model for our institution. We started the process with two goals in mind, to provide the best LMS system for HSU students and to further support student success,” said Enyedi. Amy Rock, an instructor in the departments of Environmental Science & Management and Geography, is an early adopter of the Canvas LMS and a faculty ambassador for Quality Learning & Teaching. During Rock’s presentation of her Introduction to GIS course (GSP 270), which utilizes Canvas, faculty members remarked at her use of eye-catching and informative graphics, which work as visual guides for students who are navigating the site. Rock especially appreciated the ability to customize the look and navigation of the course. “Since I teach largely visually-oriented courses, to me, design is an important part of setting the tone of the class. I can set up a visual ’front door’ to help students quickly navigate course sections, and keep sections neatly organized and engaging using the editing tools,” she said. Students and faculty are also excited about the highly integrated and easy-to-use grading tools. Christine Dobrowolski, a Health Education instructor in the Department of Kinesiology and Recreation, led a demonstration of the Canvas SpeedGrader, which aims to make grading much more efficient by giving instructors the chance to give feedback in video, audio or text and provide clear guides on how grades are assigned. “Grading rubrics give students a clear understanding of the expectations, as well as an understanding of their grade. In addition, the rubrics allow instructors to link learning outcomes to assessments,” said Dobrowolski. Students have also reported appreciating better information about the grades they receive. At these training sessions, as well as in online tutorials, faculty will learn how to use Canvas tools that can expand the impact of their teaching and engage students in a dynamic learning process with the goal of student success. School of Education instructor Heather Ballinger was relieved after attending the first session of Creating Your Canvas Course. “This training helped alleviate my anxiety about the transition. Everyone was very supportive,” Ballinger said. In addition to weekly trainings, the Canvas Team is also providing numerous Canvas Support Drop-In Sessions and Teaching and Learning Luncheons. 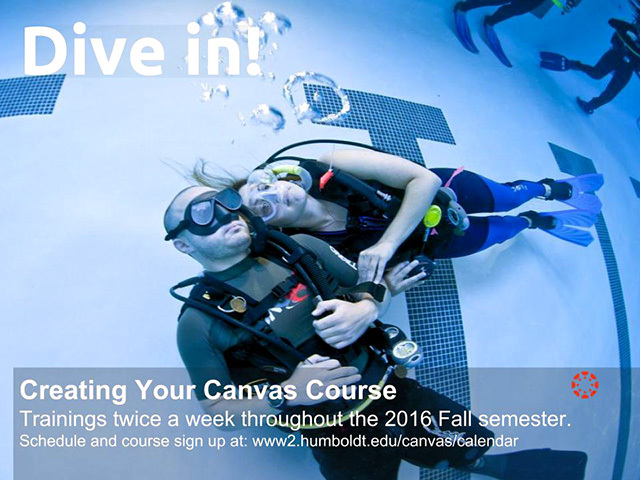 A calendar of upcoming sessions can be found at the HSU Canvas website – https://www2.humboldt.edu/canvas/calendar. More information about the Canvas LMS migration and training can be found at https://www2.humboldt.edu/canvas/welcome.